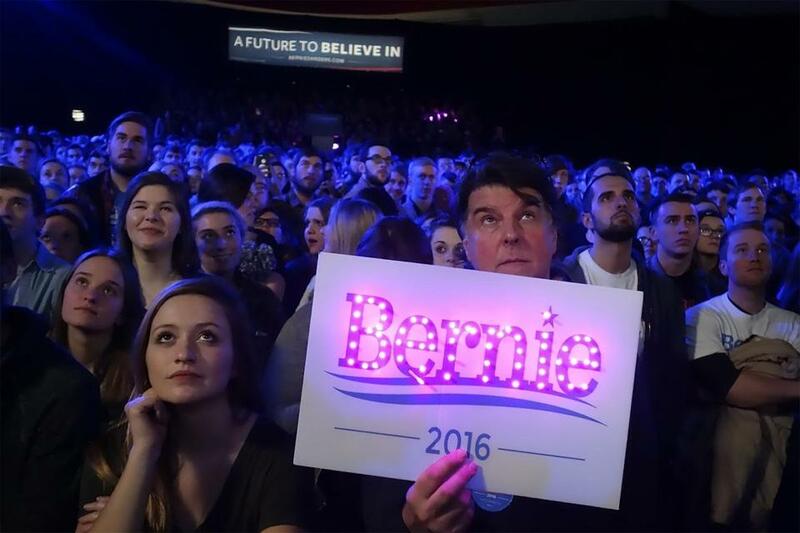 Supporters of Democratic presidential candidate Bernie Sanders listened to an address in Iowa City Jan. 30. In the wake of the stalemate between Hillary Clinton and Bernie Sanders in Iowa this month, the primary season will have to continue a little longer to finally answer the question of whether the United States can truly embrace a vision of social governance — democratic socialism — that has found fertile ground overseas, but never become firmly rooted here. Since William Jennings Bryan, strong progressives have made it to the ticket of the modern Democratic party, but none would say the word socialism. Eugene Debs and Norman Thomas both ran on a socialist ticket but never got more than a tiny percentage of the vote. Has anything changed? The Harvard political scientist Louis Hartz famously argued in 1955 that, despite our family quarrels, we Americans are all liberals. Liberal, in this classic sense, means we believe government exists to protect individuals’ life, liberty, and property — euphemistically “happiness” in the Declaration of Independence. We pragmatically stretch this concept some, but only so far. Uniquely among Western nations, Americans lack a proper conservative tradition stretching back to a feudal past, and because of that lack — strange as the logic may initially sound — we also lack a serious socialist tradition looking forward to a transformative future. Hartz’s “The Liberal Tradition in America” has been debated ever since he wrote it, but it retains extraordinary power to explain events. Yes, Americans have espoused countless illiberal beliefs, from a Dixie nationalism defending slavery and then racism — not only in popular belief but in a supposed political philosophy — to the meteoric ideologies of the 1960s: Black Power, the counterculture, the New Left. But where are they now? South Carolina lowered the Confederate flag, and the Dixie political philosophy suffered the worst intellectual damnation: It was just ignored. The New Left fizzled as Richard Nixon marshaled the “silent majority” counterattack. The counterculture dissolved into “life-styles.” What Black Lives Matter demands today is that police treat people equally and respect their liberal rights. The movements for women’s rights or gay marriage likewise ask for equal treatment before the law and in practice. But we confront some problems that do not fit into the liberal framework. Foreign policy is one area. The end is nowhere in sight of the disastrous error in supposing that, if Saddam were unseated, the Middle East would leap to adopt a government based on the same “truths” that we hold to be “self-evident.” At home, the specter of gross inequalities of wealth challenges liberalism. In liberalism’s race to get ahead, Hartz said, the insecurity of those who win provokes their escalating displays of wealth, but the anxieties and pain of those who fall behind cut deeper scars. Liberalism offers no remedies for these scars because it only defends purely individual rights. Deep divisions might undermine the unwritten social solidarity that is the essential foundation of liberalism itself. After all, other states have tried modeling constitutions on ours and found that, without America’s liberal solidarity, they have failed. Even as socialists reacted against feudal conservatism, they appropriated its concepts of organic society, social classes, and a right to dignity. Can Bernie Sanders — and Americans broadly — capture and retain belief in a society, as an organic whole, that rejects extreme inequalities of wealth and seeks to incorporate everyone as a dignified member? Important a force as liberalism has been for progress, can we finally stand far enough outside ourselves to recognize its limitations? Liberalism for Hartz was not welfare-state liberalism, but the liberalism of John Locke — requiring a timeless present. The opening phrases of the Declaration are worth a second look: “We hold these truths to be self-evident, that all men are created equal, that they are endowed by their Creator with certain unalienable Rights.” We in America establish government to protect individuals’ rights, and we can justly abolish it if it fails to. Historically, these were not self-evident truths. The polis, or political unit, for Aristotle, was “prior in the order of nature to the family and the individual.” The Greek philosopher could not have conceived of individuals in a “state of nature,” as Locke assumed, instituting government to protect rights. Rather, Aristotle supposed, humanity always belonged to society. Only “a beast or a god” could exist outside the polis, he surmised. Catholic theology adopted Aristotle. Communion incorporated believers into the body of Christ and spiritually united them in the corpus mysticum, the mystical body that was the church. As nations emerged from the Middle Ages, kings claimed divine right, and rested the order of the state, on what they sometimes called the corpus mysticum. No sooner did liberalism sweep Europe — “liberty, equality, brotherhood” in the cry of the French Revolution — than the conservative reaction set in, looking to what it saw as a more humane past. European conservatives, quite unlike modern American conservatives, recoiled at unbridled individualism and markets that they saw as tearing society asunder. Socialists reacted against conservatism yet appropriated some of its concepts, including the idea of an organic society with different classes and the importance of workers’ rights. Americans, meanwhile, founded a liberalism not via social revolution but as the natural governance of a people born equal, Hartz maintained. “The Liberal Tradition,” Hartz concedes, is a breathtaking reduction of American history to one factor. Rather than analyze history in usual terms of class conflict or interest-group clashes, he sees the idea of liberalism as explaining the Constitution, Confederate ideology, the figure of Horatio Alger, Progressivism, the New Deal, McCarthyism. At a time when political science increasingly wanted theories that could be tested against observation, Hartz’s argument marshaled nary a historical fact. Two subtle points Hartz posits are crucial. First is this idea that American liberalism speaks outloud about the defense of individual rights, but requires an unspoken solidarity among a people born equal to sustain. Otherwise the words on paper count for nothing. Liberalism, in fact, is our conservative tradition. There’s even a religious element here: Americans are endowed “by our Creator” with unalienable rights. The founding fathers even invented a kind of monarch: the Constitution. Citizens can completely disagree about what it says, but itself, it can do no wrong. The second subtle point is that Americans are unconscious liberals. We are so Lockean we don’t even realize it. Liberal truths are self-evident. Of course, we haven’t read Locke, and Hartz himself doesn’t care quite what Locke said. We have absorbed the Locke that filters down to us so thoroughly we don’t know it. Unconscious liberalism has great strengths. Hartz marveled at conservative political philosophers of the Confederacy who invented a neo-feudal ideology to justify a slave society. But they failed. Slavery was not feudalism, and they were so unconsciously imbued with Thomas Jefferson that they didn’t even believe themselves. Of course, generations of white Southerners remembered Dixie ideology in the Ku Klux Klan and discrimination. But Thomas Jefferson (even though the man owned slaves) keeps winning as the lowering of the Confederate flag in South Carolina showed last year. At home, we turn foreign -isms that do not share our truths into nightmares. McCarthyism haunted Hartz’s world. Europe had far more communists — even communist parties — but Europeans obsessed far less about them than we did. Islamist terrorists are a danger, but since 9/11 they have committed 26 homicides within the United States, while homegrown fanatics have committed 48, according to the New America institute. Unconscious liberalism warps progressive politics, too. Early 20th-century Progressives set the goal of trust-busting, the way we now attack banks that are too big to fail. These policies make enough sense but do not constitute progressive politics. They only point to a Horatio Alger world — not a societal vision or even a society at all. This election cycle so far has caught most Americans off-guard, as anti-establishment candidates garner far more support than even they imagined possible. Louis Hartz suggests why we arrived at this juncture. The American Dream may still be alive in our collective imagination, but even those who don’t know the statistical data realize that social mobility is even lower in America than in less inegalitarian nations — and their post-feudal societies put less burden on individuals to succeed. It isn’t just pocketbook but social pressure. We borrow and spend on an ever mushrooming array of goods, advertised every time we turn on a tablet, as necessary to be dignified members of the community. No wonder presidential politics has become so raucous. Hartz argued that national ideology can change when the structure of society comes into deep enough conflict with it. Donald Trump is an old standby of unconscious liberalism, but Bernie Sanders just might be a real democratic socialist. His campaign focuses on rectifying income inequality, a product of liberalism that liberalism cannot address because it only speaks of individual rights. Perhaps this is even a properly conservative issue, invoking the idea of a society as an organic whole. Bernie also talks about class, which is unusual for a major-party candidate. American progressives, Hartz notes, could never invoke the word. His surge of support from “less affluent” whites, earning less than $50,000 — a group that has not recently supported progressive politics — suggests we may even be thinking more in class terms. And this at a moment when the Eurozone, home of conservatism and socialism, keeps forcing debtor nations to erode unions and welfare. Of course, Sanders’ campaign could well be just another progressive meteor that burns out. “In some sense the tragedy of these movements,” Hartz writes, “has lain in the imperfect knowledge they have had of the enemy they face.” That enemy, of course, is their own unconscious liberalism, a liberalism that they don’t recognize. Hartz ends his book asking whether a people “born equal” can ever overcome this obstacle: “Can it ever understand itself?” Maybe, just maybe. Correction: An earlier version of this story misidentified the pope who wrote the 1891 encyclical, which hailed unions as counterparts of Medieval guilds. It was Pope Leo XIII, not Leo VIII.